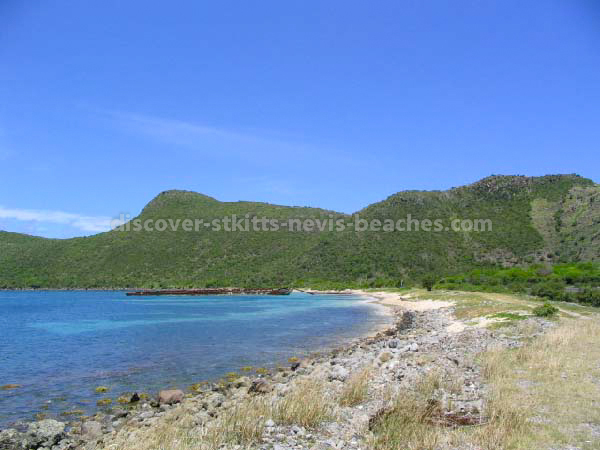 The Caribbean beaches in St Kitts Nevis possess all the above characteristics and much more. That is why at Discover St Kitts Nevis Beaches, we have chosen to share our perspective and photographic views of the Caribbean beaches in St Kitts Nevis. In St Kitts, some of the most tranquil Caribbean beaches including Friar's Bay, Cockleshell Bay, Major's Bay and Banana Bay are located on the Southeast Peninsula, an area that was previously only accessible by boat or by hiking over the steep hills. 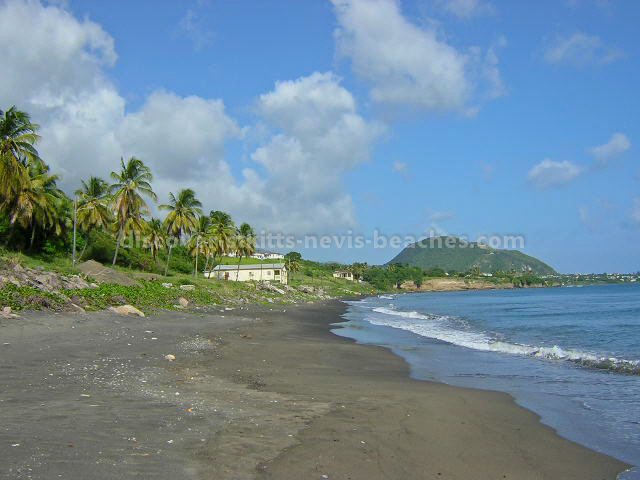 In Nevis, the western coast is home to some top quality beaches including Pinney's Beach, Oualie Beach and Cades Bay. The islands of St Kitts and Nevis are also home to some Atlantic beaches such as North Frigate Bay, Sand Bank Bay and Mosquito Bay (Turtle Beach) where the waters are rough because they are located along the Atlantic coast. So... which Caribbean beaches in St Kitts Nevis are most popular? I'd have to say South Frigate Bay, Cockleshell Bay and South Friar's Bay in St Kitts and Cades Bay, Pinney's Beach and Oualie Beach in Nevis are definitely the most popular. These golden sand Caribbean beaches in St Kitts Nevis are perfect for swimming, snorkelling and just about every kind of water sport or beach activity, and do in fact offer a variety to choose from. Other Caribbean beaches in St Kitts Nevis include Majors Bay, Banana Bay, Cockleshell Bay and White House Bay on the Southeast Peninsula and Basseterre beach, Pump Bay and Belle Tete in St Kitts, and Gallows Bay, and the beach at Fort Ashby in Nevis. 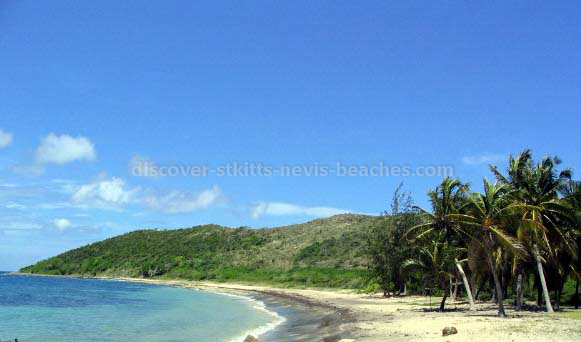 And of course, there are the less known Caribbean beaches in St Kitts Nevis, that most people don't know about. In my opinion, Frigate Bay South is the most popular and best beach in St Kitts outside of the beaches on the Southeast Peninsula. This Caribbean beach has a long stretch of golden sand and the waters are mostly calm. There are beach bars (including Mr X Shiggidy Shack Bar & Grill and Monkey Bar) and restaurants that sell a variety of cold drinks and mouth watering foods. This beach is ideal for swimming, windsurfing, and water skiing so do check out the wide range of water sports and other beach activities on offer. There is good snorkelling at either end of the beach where the rock cliffs begin. The South Frigate Bay beach is home to Mr X Water Tours formerly Mr X Water Sports. Mr X Water Tours offers a variety of water based excursions including water taxi services between the cruise ship dock at Port Zante and Frigate Bay, snorkelling tours, deep sea fishing charters, trips to Nevis, sunset cruises and private charters for destination weddings, special events and small parties. The beach at South Frigate Bay is home to Timothy Beach Resort, the only hotel on a Caribbean Beach in Frigate Bay. Located on the Southeast Peninsula, South Friar's Bay is a great swimming beach with a long stretch of golden sand and calm waters. This Caribbean beach which is a favourite for both tourists and locals is perfect for water sports, especially snorkelling. It is also a great spot for a beach picnic or party. In fact I had a birthday beach bash there in 1999. 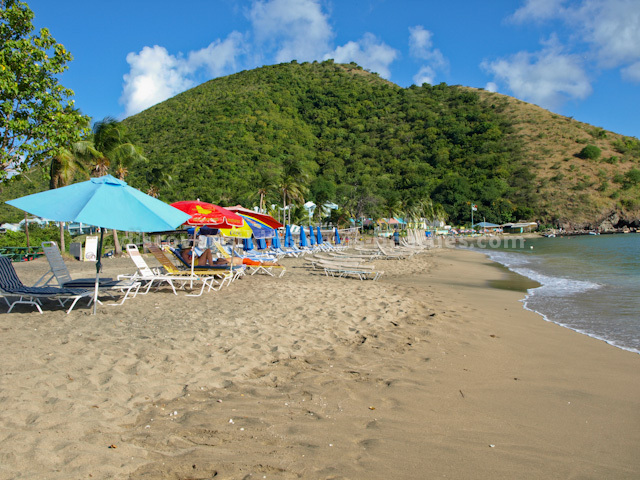 South Friar's Bay is home to Carambola Beach Club, a fine dining restaurant, as well as Godfather's, Sunset, Jam Rock and Shipwreck Beach Bars where you can purchase a variety of food, ice cold beer and other drinks. 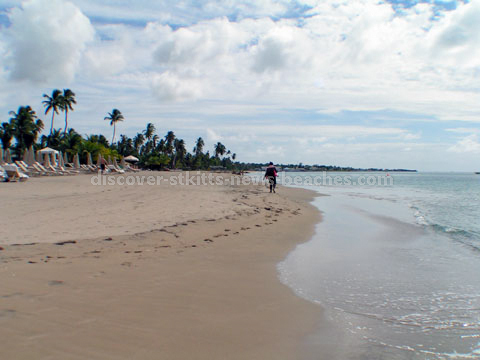 This beach is one of the popular beaches included in theSt Kitts excursions offered by Captain Sunshine Tours. Majors Bay has a long stretch of golden sand beach. The beach at Majors Bay is lovely, the waters warm and calm. It is perfect if you are looking to get away from the crowds. And you won't have to worry about food and drinks since there is a new beach bar here, the Major's Bay Beach Bar (I prefer to call it Bucky's Beach Bar after its owner). Bucky is a great chef, and has a keen sense of humour, so I'm sure you will enjoy the delicious tasting food he serves up. He is also known for making some great tasting drinks (some of which he hasn't even named). Just ask him to mix you a special drink. In addition to being a great beach, Major's Bay also offers a relatively well protected small boat anchorage. So don't be surprised if you see some yachts anchored off Majors Bay. (Note: Unfortunately, Bucky's Beach Bar was destroyed by fire some years ago so it is no longer in existence.) The bay is also a good resource for shellfish and fin fish, so if you have a fishing rod bring it along with you and see what you can hook. Every time I go there, I always see people fishing right from the shores. Banana Bay is a secluded Caribbean beach in St Kitts located at the tip of the Southeast Peninsula. The calm waters, soft golden sand and tall coconut trees swaying in the ocean breeze render the beach at Banana Bay ideal for a tranquil and romantic escape, a leisurely stroll, snorkelling or a quiet swim in the pristine waters while taking in the breathtaking view of Nevis, located just across the channel. No water sports operators are based on this beach, so be certain to bring along your snorkelling equipment if you plan to snorkel. If you are lucky you may see schools of ballahoo and gar jumping offshore, so remember to bring your camera along to photograph the jumping fish or the beautiful vistas of the Southeast Peninsula. Since there are no beach bars or restaurants at Banana Bay, I'd recommend that you pack a picnic basket with goodies and a cooler filled with cold drinks so you can have a private beach picnic under the coconut trees. This tranquil beach was once the home of the Banana Beach Hotel. Cockleshell Bay is a long stretch of golden sand beach located next to Banana Bay at the tip of the Southeast Peninsula. It is a great beach for swimming and is fast becoming a popular spot for beach picnics on public holidays. This Caribbean beach was once home to the Cockleshell Hotel. While there, be sure to check out the Reggae Beach Bar and Lion Rock Beach Bar if you get hungry or just need an ice cold drink. The beach at Cockleshell Bay is also an ideal setting for a holistic St Kitts massage. Pump Bay is an intriguing black/grey beach located in the town of Sandy Point. 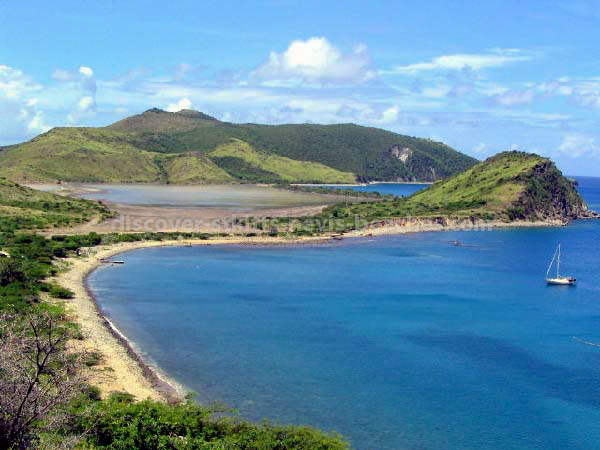 Sandy Point lies on the south western coast of St. Kitts some 10 miles west of the capital city of Basseterre. Pump Bay is a popular beach among the residents of the Sandy Point, Fig Tree and La Valle communities. I understand that there was a jetty at one time at Pump Bay where boats from the neighbouring islands would dock. It was also common for persons for the Fig Tree and La Valle communities in Sandy Point to travel by boat from Pump Bay to St. Eustatius. 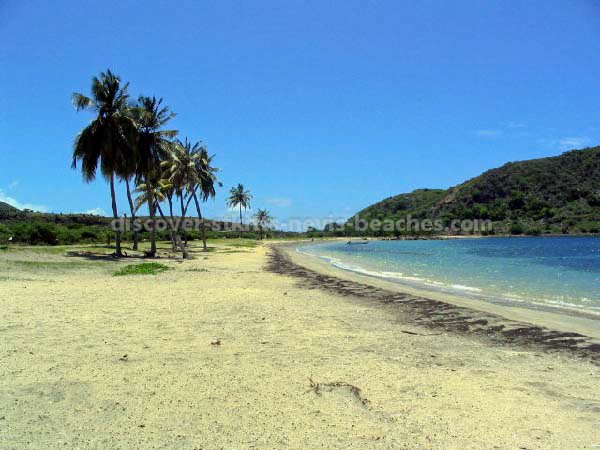 The beach at Belle Tete is located close to La Valle estate in Sandy Point. There is a long and wide stretch of black/grey sand beach. The major sand spits on this Caribbean beach at Belle Tete are created by the conversion of currents. The leeward side of this beach is relatively calm, however I am told that there are strong undercurrents. Just around the corner on the north western end is the windward side of the beach where the waters are rough, and large waves ideal for surfing race toward the shore. The area of land stretching from La Vallee to Cranstoun Estate just outside of Newton Ground is in the process of being developed into a golf resort built around a championship 18-hole golf course. Pinney's Beach is in my estimation the best Caribbean beach in Nevis. This golden sand beach stretches for about four miles and is renowned for its calm waters and beach bars. It is a perfect beach for swimming and wading. Tall coconut trees that sway in the gentle breeze form the dense backdrop to this magnificent showpiece. Pinney's Beach is home to the Golden Rock Beach and the luxurious Four Seasons Resort. It is also home to the internationally known Sunshine's Beach Bar and Grill, where Sunshine is eager to serve you mouth-watering grilled lobster, chicken, fish or shrimp. While there you will also want to try Sunshine's popular "Killer Bee" special rum drink. Sunshine's Beach Bar and Grill was recently designated as an AAA/CAA Approved property. Chevy's Beach Bar and Grill is also located on Pinney's beach in Nevis. 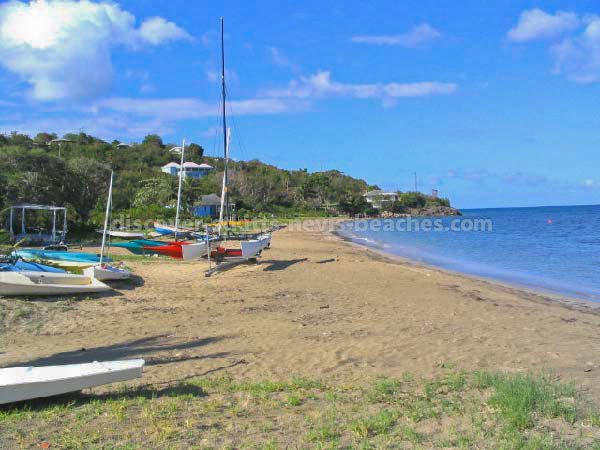 The beach at Cades Bay is located between Pinney's Beach and Oualie Beach. This golden sand beach is great for swimming, and it's a long enough stretch of beach for walking. It is home to the Inn at Cades Bay which features 16 oversized bedrooms. Tequila Sheila's, the Inn's restaurant is located on the beach. Tequila Sheila's has entertainment on Saturdays and Sunday Brunch with live music. 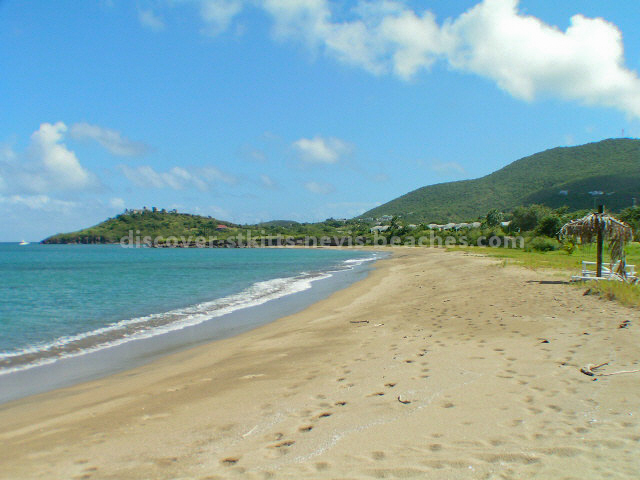 Oualie Beach is a golden sand Caribbean beach located in a sheltered cove on the north western coast of Nevis. 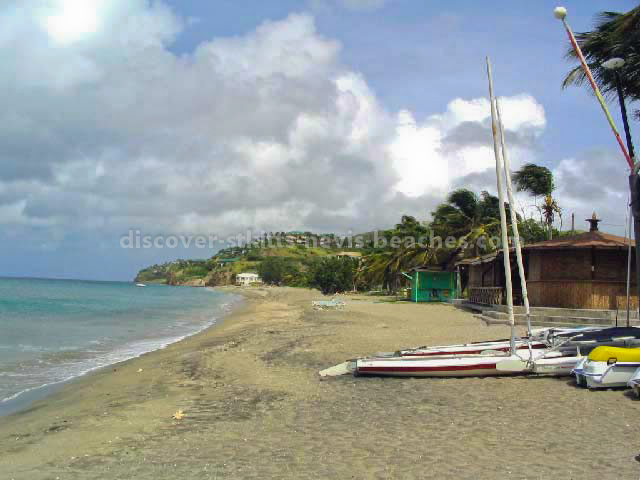 This beach offers a wide variety of water sports including windsurfing, sailing, and kayaking. Oualie is a great swimming beach and is well known for its superb diving and snorkelling. Under the Sea Sealife Education Centre, an aquarium/education facility created by Marine biologist Barbara Whitman was once located at Oualie Beach. It has since been relocated to Hawaii. Water sports operators located at Oualie Beach include Scuba Safaris, Nevis Water Sports, Turtle Tours and Windsurfing Nevis. Small boat anchorage is available at Oualie Beach. Tuesday nights at Oualie is Barbeque night featuring live music from the Oualie Beach Boys Band. Then on Saturday nights, the feature is traditional string band music from "The Humming Birds". The last Sunday of every month is dubbed Super Sunday at Oualie Beach, with lots of food, drinks, beach activities and steel pan music. 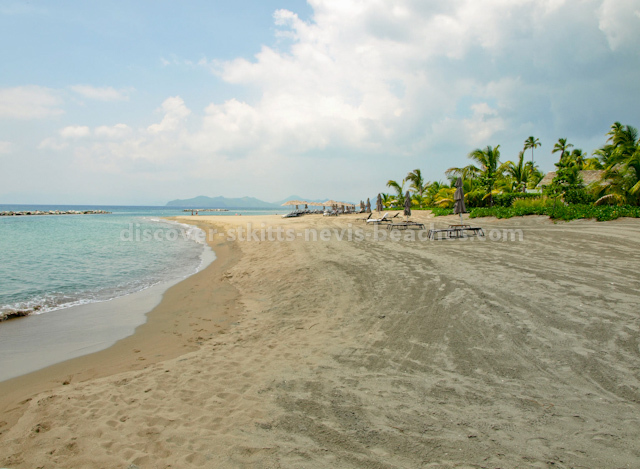 Oualie Beach is home to Oualie Beach Hotel and Coldwell Banker St. Kitts Nevis Realty Ltd / Oualie Reality. 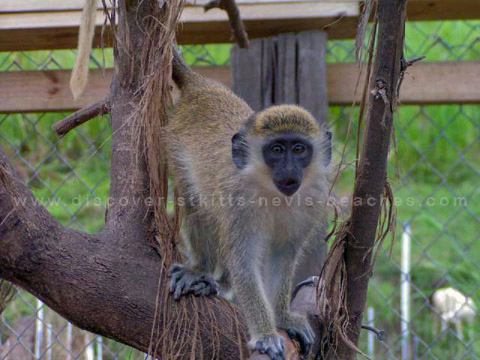 The above information focused on the more well known Caribbean beaches in St Kitts Nevis. 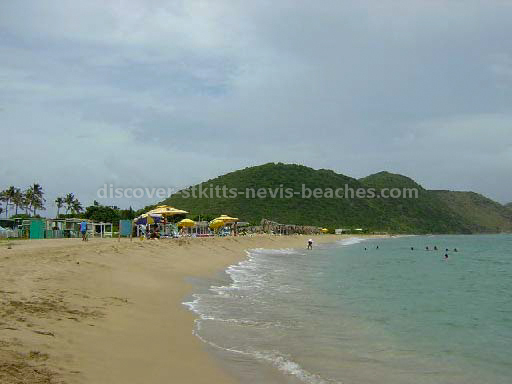 There are however several more less known beaches in St Kitts Nevis that were not featured. Although most of these less known Caribbean beaches in St Kitts Nevis are black sand beaches, I am sure you will find them intriguing. 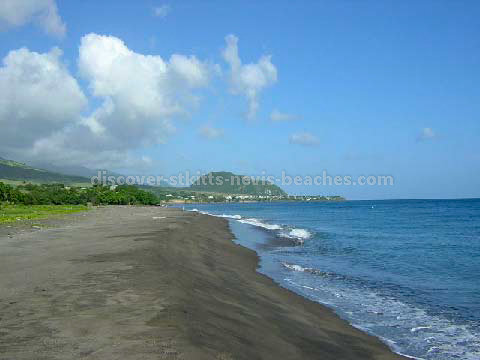 And should you ever get a chance to visit these black sand Caribbean beaches in St Kitts Nevis I know you will find that they exhibit the some of the same tranquil, pristine and uncrowded characteristics of the Caribbean beaches in St Kitts Nevis that are featured on this page. I hope that my tour of the Caribbean beaches in St Kitts Nevis was able to provide a sneak peak of what you can expect when you visit. Throughout my site I will share my personal perspective and photographic views of the Caribbean beaches in St Kitts Nevis as well the Atlantic beaches. One of the ways I will do so is via my St Kitts Nevis Blog, which will include some of my personal photos of the local beaches including the Caribbean beaches in St Kitts Nevis.